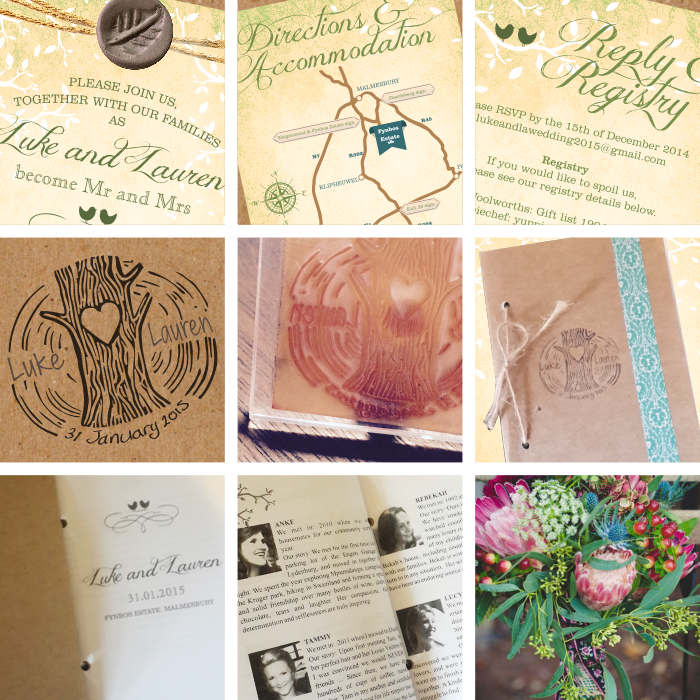 Today we're sharing wedding stationery design completed a short while ago for Lauren & Luke Moore. Initially they would have liked handmade invites but, for convenience sake, they opted for an electronic invite instead and with little printed brochures detailing info on how they met each member of the entourage. The overall look and feel was to be quite rustic and organic. The electronic invitations consisted of 3 items: the invitation proper with a clay leaf seal we made and photographed especially, directions and accommodation options, and gift registry info. The bridal couple wanted a tree/leaf them to run throughout their stationery so we created a tree branch with 2 lovebirds and floating leaves in a simple iconic style and carried it across the 3 items and their brochure. Lauren really liked the idea of making her own covers for the booklets so we provided her with the components to do this: printed inner pages, blank kraft board covers and a custom designed stamp. She punched and tied them together with string, stamped the covers and finished them off with a strip of washi tape. The newlyweds sent us a really great review on their stationery. You can read it below the images.